Clear planning and accurate design elements are critical to ensuring that landscape design projects of any size go as smoothly as possible while avoiding costly changes after construction has started. 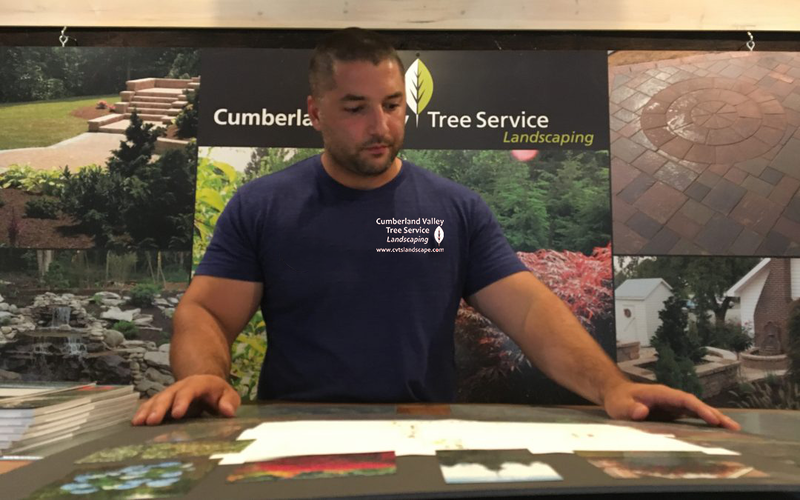 At Cumberland Valley Tree Service – Landscaping, our four on-staff designers create and present concepts to clients as either hand-drawn 2-D drawings or as 3-D computer-generated renderings. Most people, unless you have some landscaping background or you’re visually creative, need that kind of visualization. When you look at it from the business standpoint, we want things to go smoothly and on-budget and on-time, and it helps to get everybody on the same page from the get-go. Both models provide accurate, to-scale depictions of what finished products will look like, but they each have their own advantages and disadvantages depending on the requirements of the specific project. For residential-sized projects, the properties are usually small enough that hand-drawn plans are faster and easier to produce. The plans are often accompanied by photographs of specific plants and flowers to help homeowners visualize the finished product. I feel that when you draw and color a landscaping plan by hand, it’s more artistic, and I think that homeowners can connect to it easier than the computer-generated version. Landscaping designs have grown more complex over the past twenty years, and it can be hard to visualize how the space will look and feel when the project is completed. Software is getting better all the time, and it can be a powerful tool for campus-sized projects or large outdoor living spaces. Something 2-D might not look like much when viewed from above – even if it is actually very complex. The 3-D rendering allows the homeowner to appreciate all of the design details, and it allows them to adjust details such as the height of patio tiers or fireplace hearths before we start to build. The conceptual drawings are presented after the initial visit to the site. We will schedule a time when we can either visit the site and explain how it will all come together or we can give the presentation in our own design studio. Contact us today to start discussing how you can get more out of your property through better landscaping, which starts with good design. And good design from the start – beginning with the consultation – saves time and money throughout the entire process.